1. THE EMPEROR. The Japanese Constitution provides that the Emperor is Commander-in-Chief of the Army and Navy; that he determines their organization; and that he declares war, makes peace, and concludes treaties. He is advised by two military councils: the Board of Marshals and Admirals and the Supreme Military Council. 2. IMPERIAL HEADQUARTERS. 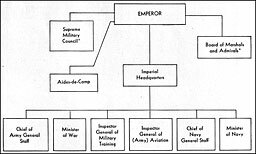 In war time or in case of grave emergency an Imperial Headquarters is established, under the supervision of the Emperor, to assist in the exercise of supreme command. 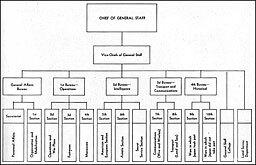 It consists of the Chiefs of the Army and Navy General Staffs, the Ministers of War and of Navy, and a staff of specially selected officers (see fig. 3). The General Staff (Sambo Hombu). The Inspectorate General of Military Training. The Inspectorate General of Aviation. 4. THE GENERAL STAFF. 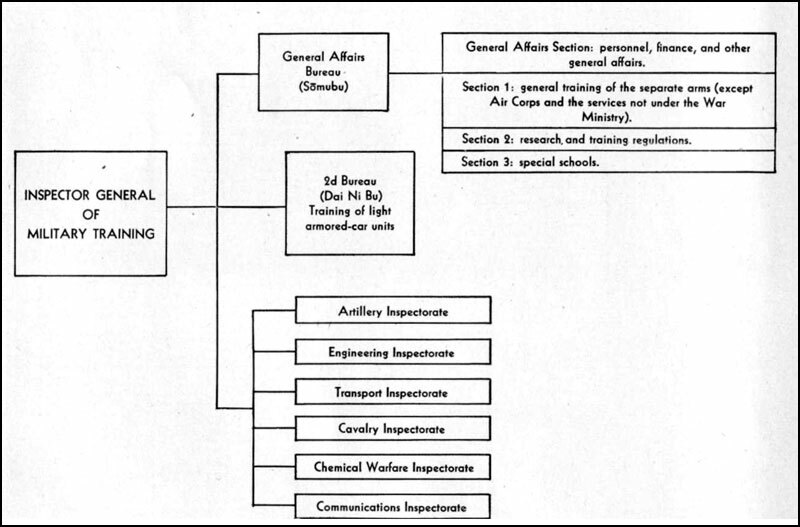 The General Staff comprises five bureaus: General Affairs, Operations, Intelligence, Transport, and Historical. It. is charged with the preparation of war plans; the training and employment of combined arms; the direction of large maneuvers; the movement of troops; the compilation of field service regulations, maps, and military histories; and with supervision of the General Staff College and the Land Survey Department. The Chief of the General Staff is appointed by the Emperor. 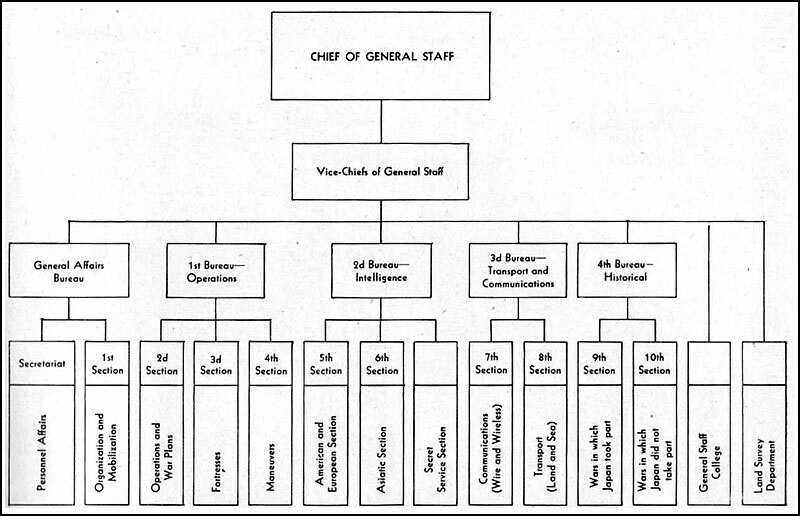 The General Staff is organized as shown in figure 4. Figure 3. The Japanese High Command. * The Supreme Military Council and the Board of Marshals and Admirals act in an advisory capacity. Diet. 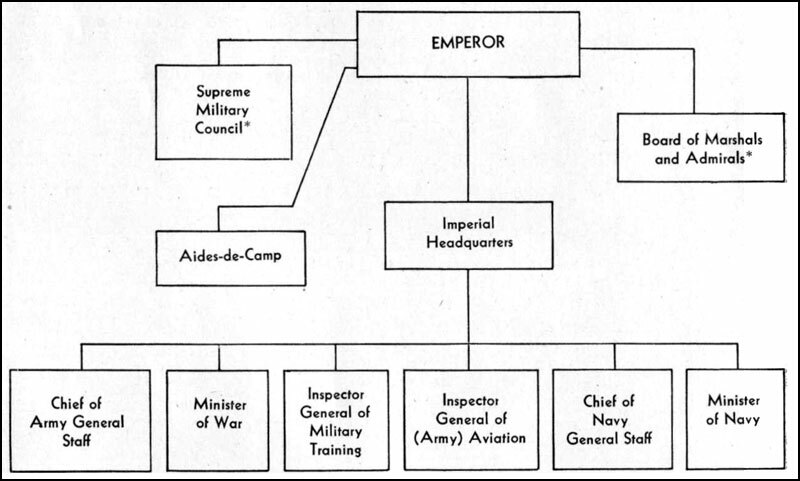 He must be a general or lieutenant general on the active list, and he is directly responsible to the Emperor. 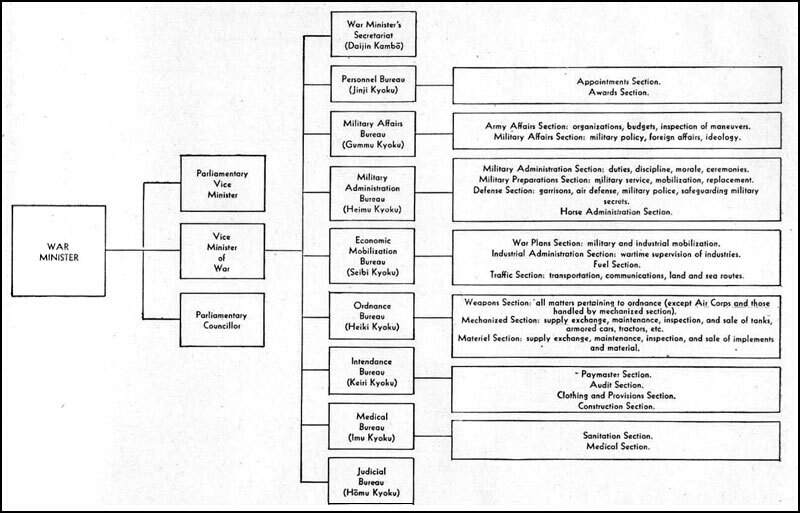 The Ministry of War is subdivided into the Secretariat and eight bureaus (see fig. 5). Figure 4. Army General Staff Headquarters. Figure 5. Ministry of War. Technical Headquarters, including Scientific Research Institute. Army Supply Depot (military supplies other than ordnance). Mechanized Headquarters, believed to include training and development of mechanized units. Medical and Veterinary Supply Depots. 7. THE INSPECTORATE GENERAL OF AVIATION. This agency was created by an ordinance issued 7 December 1938 to supervise Air Corps training. It comprises a General Affairs Department and a Training Department and is headed by a general or lieutenant general. 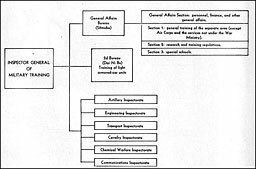 In aviation training matters, only, is it directly responsible to the Emperor; in other respects, the Inspector General of Aviation is subordinate to the "Big Three" (Chief of General Staff, War Minister, and Inspector General of Military Training). The Inspector General of Aviation may be said to rank with, but after, the "Big Three." Figure 6. Inspectorate General of Military Training. Figure 7. 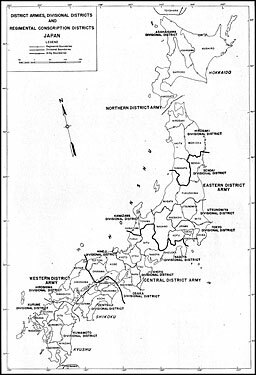 Conscription Districts of Japan. 1. TERRITORIAL ORGANIZATIONS. a. Japan Defense Army. The territorial army organizations of Japan proper, Korea, and Formosa are under command of the General Defense Headquarters (Boei Soshireibu) which was created in 1941 and is responsible, through the Imperial General Headquarters, to the Emperor. 3. DIVISIONAL AND REGIMENTAL DISTRICTS (Shikan, Rentaiku). The army districts are split into divisional districts. These, in turn, are divided into regimental districts which raise recruits for all arms and services. The geographical distribution of these districts is shown in the following table. Numbers following in brackets show the original division raised in the district and perhaps do not represent the division now stationed there. Northern District Army. Sapporo Asahigawa (7), Hirosaki (8). Eastern District Army. Tokyo Tokyo (1) (Guards)*, Sendai (2), Kanazawa (9), Utsunomiya(14). Central District Army. Osaka Nagoya (3), Osaka (4), Himeji (10), Kyoto (16). Western District Army. Fukuoka Hiroshima (5), Kumamoto (6), Zentsuji (11), Kurume (12). * Guards Divisional District Headquarters is located in Tokyo, but recruits are drawn from all over Japan. Northern District Army (headquarters Sapporo) Asahigawa (7th). Sapporo. Eastern District Army (headquarters Tokyo). Tokyo (1st). (Tokyo). Central District Army (headquarters Osaka). Nagoya (3d). Nagoya. Central District Army (headquarters Osaka.) Osaka (4th). Osaka. Western District Army (headquarters Fukuoka) Hiroshima (5th). Hiroshima. Korea (Chosen) (headquarters Keijo). Ranan (19th). Ranan. Formosa (Taiwan) (headquarters Taihoku). Taihoku. (1) Equipping and providing refresher training for recalled reservists. Small detachments of the depot division are assigned these duties. (2) Organizing and equipping new divisional units. (3) Providing loss replacements for divisions and other active units, furnished by the divisional district in which the depot division is stationed. (4) (a) Other functions are: recruiting and training nondivisional units located in the divisional district; supervising men transferred to the reserve and military training in the district's schools; and arranging for the return to Japan of casualties and the ashes of the dead. (b) In some cases, a field division, which originally was raised in one of the divisional districts, will return to that district to rest and refit, and may absorb or take over the functions of the depot division. b. Strength. The strength of depot divisions probably varies from 10,000 to 20,000, depending upon the number of conscripts and reservists being trained. Since depot divisions generally are organized to engage in field exercise and other forms of combined training, it is believed that after a brief period of field preparation, the units should be capable of engaging in combat, especially in defense of their homes areas. divided into military affairs districts (Heijiku). Formosa possibly has one divisional recruiting district, likewise divided into military affairs districts. 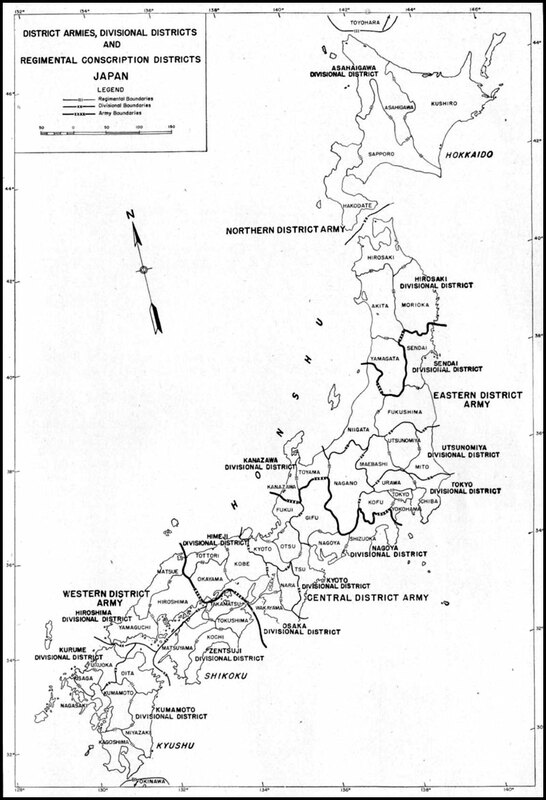 While the exact functions of these military affairs districts are not established, it is believed that their principal duty is the recruitment of resident Japanese and natives. d. Dispatch of troops to field. 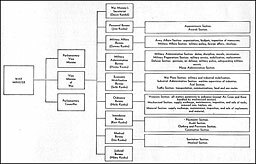 In war each divisional district dispatches to theaters of operations, or other assignments, several divisions and other units, including, for example, independent mixed brigades. This is accomplished by one or two methods. (1) The method used in an emergency is to send to the field the bulk of the depot division, raising it to full strength with first reservists (Yobihei) and conscript reservists (Hojuhei), and retaining in the divisional district a small cadre for each unit of the depot division. The division sent to the field retains the number of the depot division. The depot division then is rebuilt by calling other conscripts and reservists to the colors. (2) A second method is to form the new division From a small nucleus of each unit of the depot division by adding to this cadre a large number of reservists. Under this method the new division usually is mobilized in billets or camps in the vicinity of depot divisions, but it does not actually occupy peacetime barracks. Such a division is given a new numerical designation. It is likely that both methods, as well as variations of these methods, have been employed. 3 Infantry Regiments (Replacement Units (Hojutai)). 1 Artillery Regiment (Replacement Unit). 1 Cavalry or Reconnaissance Regiment (Replacement Unit). 1 Engineer Regiment (Replacement Unit). 1 Transport Regiment (Replacement Unit). 1 Medical Unit (Replacement Unit). 1 Signal Unit (Replacement Unit). 1 Supply and Repair Depot. 1. GENERAL. The complements of Japanese field units are usually sufficiently high to provide for what are ordinarily considered first replacements. When these supernumeraries have been exhausted, two methods of reinforcement are normally employed. 2. METHODS OF REPLACEMENT. a. Direct call on depot division. The first is for the unit to call directly upon the depot division, or the active division occupying its divisional district. The replacements consist of officers and enlisted men of such rank and degree of training as specified by the field commander. This method is the one preferred by the Japanese, for it preserves their system of having all men in a unit come from a particular divisional district. It has the obvious disadvantage of being time-consuming. b. Field replacement units. In order that a unit in the field, which has suffered heavy casualties, may receive replacements quickly, the Japanese have devised a second replacement system. Under this, they have placed in the theater of operations a unit known as a Field Replacement Unit which normally consists of two infantry battalions plus auxiliary troops. Men in a Field Replacement Unit do not come necessarily from the same divisional district as the combat units it serves. They may be in various stages of training, ranging from veterans to those who just have finished basic training. Replacements are provided over a wide area, probably a particular theater of operations. c. Divisions as replacement. There is also evidence that after a campaign a division, which has been assigned a station in a relatively quiet area overseas (such as the rear areas in China), may perform the functions of replacement for other units not necessarily from the same divisional district. This is done by sending newly raised troops from Japan to the division for a final period of intensive training with experienced troops. After the new recruits have completed this training they are forwarded as replacements for other units.